Our faces are one of the most exposed areas of our bodies. Eventually, exposure to hot and cold, chemicals and the sun’s UV radiation take their toll and the face shows signs of ageing, including sunspots, puffy eyes, crow’s feet, fine lines and wrinkles. And although there are a number of procedures to reverse these signs of ageing, they aren’t without risks. Dermal fillers are injections of collagen or other substances used to smooth wrinkles and lines in the skin. The fillers include substances such as collagen and hyaluronic acid. An Australian woman recently lost her sight after having one of these fillers injected into her face. And this isn’t the first case of a dermal filler causing blindness. Many blood vessels lie beneath the face. Some are arteries delivering oxygenated, nutrient-rich blood, others are veins returning the “used blood” to the body. The arteries and veins form a mesh-like network around the eye, its socket and surrounding structures. Research suggests that any injection towards the nose, forehead or to the side of the eye has the potential to enter any of these arteries and force fillers back into the blood vessels, causing them to block. The eye has a single artery that goes into it from behind. Many of the reported cases of blinding suggest that minute droplets of these fillers are being forced against the flow of blood back into the head and then, when the needles are removed, the droplets disperse and block the artery to the eye, or, in some cases, major arteries to the brain, causing stroke. Dermarolling (also called microneedling or collagen-induction therapy) involves pricking thousands of tiny holes in the skin with a rolling device (see image below). It is used to treat various skin conditions, including scars, stretchmarks and acne. It has more recently become popular in facial rejuvenation, both in clinics and at home. Research has shown that dermarolling activates the cells within the skin to produce more collagen and elastin to make the skin appear plumper and firmer, but the evidence to support this is modest. In breaking the skin, it opens the body to bacteria and viruses to enter the body and cause infection, especially if “pre-treatment” creams are applied to the skin before rolling starts. Chemical peels are designed to remove dead layers of skin and are used to treat acne. Their action is similar to the abrasive nature of face scrubs, but they can be much more severe and deeper than scrubs. They can cause blistering, burns and reactivation of viruses, such as herpes simplex. They can also leave the skin looking much worse than it did before the treatment. 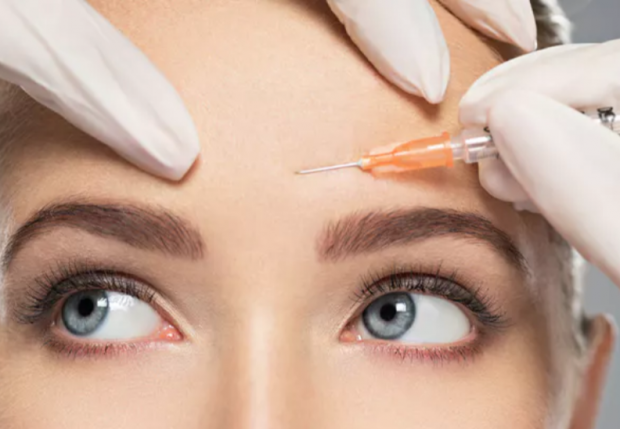 Botox (botulinum toxin) is a non-surgical, multi-purpose tool, approved to treat various conditions, including chronic migraines, excessive underarm and hand sweating and urinary incontinence (leaky bladder). But the most widely recognised use of Botox is in the cosmetics industry where it is successfully used to ease wrinkles by relaxing muscles. Getting the dose right is critical as too much causes bulging of the skin and loss of use of muscles in the region of injection. Any facial procedure that breaks the skin could be fatal. Few people are aware that the area between the corners of your mouth and the top of your nose is referred to as “the danger area of the face”, because the veins from this area connect with the brain, potentially allowing infections to spread from this area, including within the nose, to the brain. For any of the above procedures, it is important that a properly qualified health professional administers them. But even then, it doesn’t completely remove the risk of side effects and complications.